I recently added to the bookmarks displayed in the sidebar of elrst.com a great website that literally changed my way of web browsing. Netvibes proposes to keep you posted about your favorite websites and blogs as it displays their latest articles and entries via RSS feeds. Netvibes, but also Pageflakes, iGoogle and many others, are called RSS aggregators. They are becoming more and more widespread as they truly offer a new web browsing experience. Aggregators allow you to have several pages in order to sort out your RSS feeds. 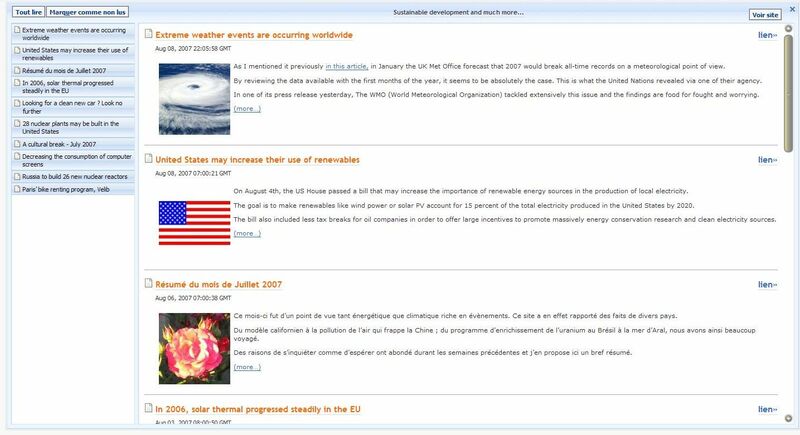 For example, you can put on a page the latest news, on another the websites related to environment, a third with all your friend’s blogs and so on. On top of that, Netvibes proposes you the weather for your city, a notepad, a to-do list, a calendar and much much more. Of course, everything is customizable as will. This technology enables me to find much quicker inspiration for articles as more data is available in less time, and I can thus concentrate on what sounds valuable to me. For a better explanation, I will show below what Netvibes displays with my blog. When clicking on an article, Netvibes shows the beginning of it, and by clicking on ” Read all ” on the left side you will be able to see a list with my ten latests articles via their introductions and illustrations. If you try it, I hope you will be as satisfied as I am of this aggregator. To keep your favorite pages you have to subscribe for free. I never received any spam or any other unwanted mail from them, which adds to the value of the service. Netvibes, but also Pageflakes, iGoogle and many others, are called RSS aggregators. Netvibes is more than a aggregator, it has widgets and many other things, uncluding a RSS aggregator. Feedreader is an aggregator and only an aggregator. You’re absolutely right when stating that Netvibes is not only an aggregator.